The Hot Wheels Elite team is getting close to releasing both their 1:18 and 1:43 die-cast models. As we've shown you previously this highly detailed model is going to be many fans lusted over product. You'll have to wait till February to get your hands on one, but in the mean time enjoy these images of the final models! We are back, and Happy New Year! Hope everyone had a great holiday season and a happy new year! The year 2012 was a whirlwind one for us, and we've taken some time off to recover. Expect things to start to pick up again with new product releases and news from of the latest fan events this year. So how've you been? Have you been enjoying your Diamond Select KITTs? Be sure to check out their latest YouTube video demoing the SPM KITT model, soon to be released! 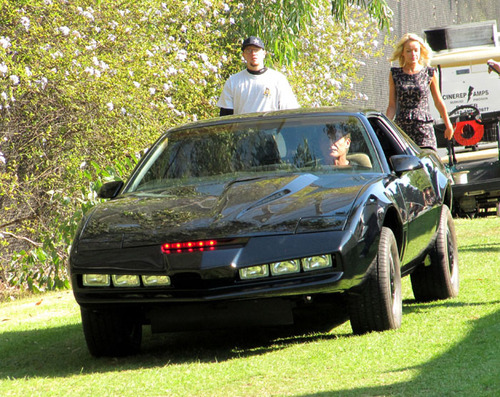 David Hasselhoff visited the LAPD Golf Tournament last weekend, arriving in his own KITT - check out this thread for more pics! A new company Kimera, is seek to put the KITT into Siri, making our smartphones actually intelligent. 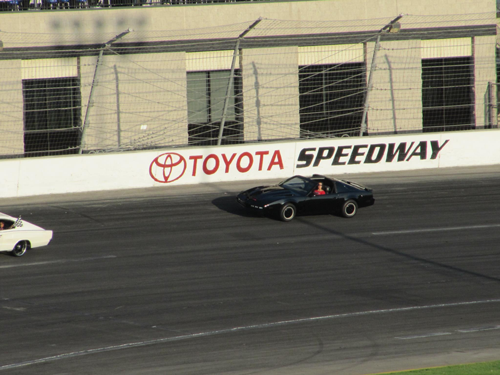 Photo above courtesy of Jen Catano, who's driving her KITT on the Toyota Speedway race track in Irwindale, California! The lovely Rebecca Holden, who played April Curtis in the second season of Knight Rider, is out with a new single! This time it's a duet with Grammy award winner Jon Secada. More can be found on Rebecca's website, including information on how to obtain your copy of the single. Congratulations Rebecca! 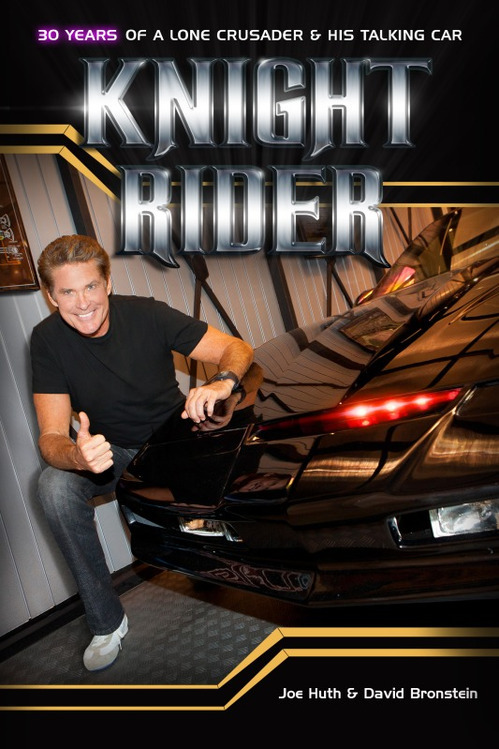 Continue reading Interview with Joe Huth, co-author of Knight Rider: 30 Years of a Lone Crusader and His Talking Car. Diamond Select Toys is getting very close to releasing their 1:15 scale KITT model, complete with light effects and working sounds! Similar to the very popular Kenner model of yore, this KITT plays through several pre-recorded phrases (activated by pressing the gas tank door, and not the license plate), but DST really steps it up by adding a working scanner and lights and sounds to the presentation. This looks to be a great product for the collector and kid alike. 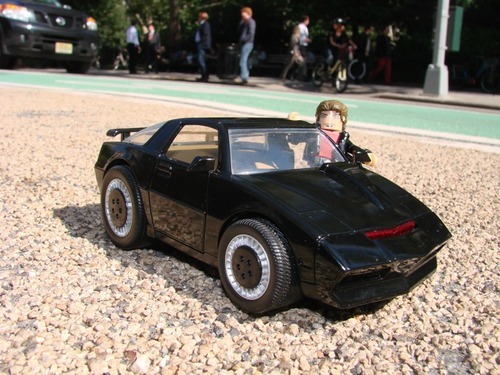 They'll be releasing a KITT only model this year, with a KITT and Michael variant in January. 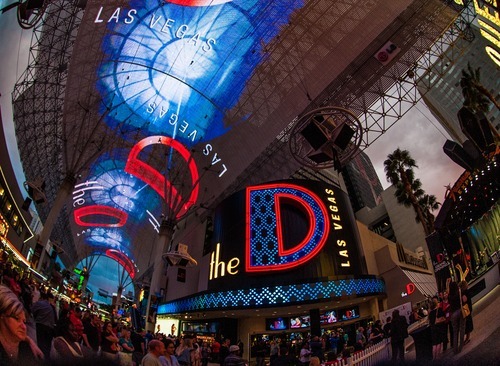 Check out the video below for a demo on the lights and sounds, as well as their press release after the jump! 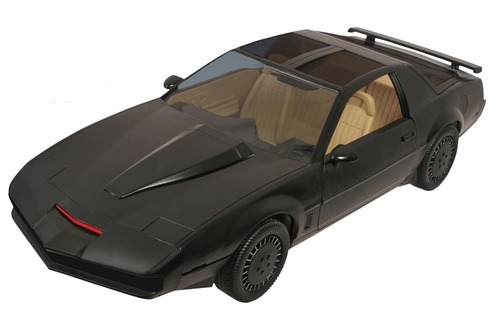 Continue reading Update on Diamond Select Toys 1:15 Talking Knight Rider KITT . 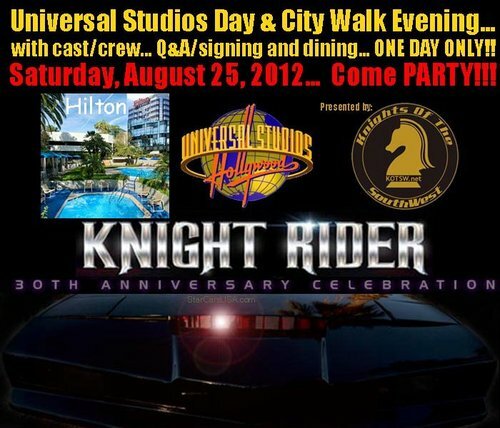 If you were looking for another way to watch the original Knight Rider, you are in luck! Cable channel G4 will begin airing Knight Rider on October 1st at 11am EST, starting at the beginning with two hour pilot. 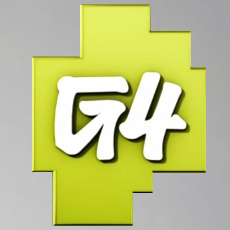 Head over to TV Guide for more information on episodes airing and check out G4's website for local listings. thanks to david net for the find! 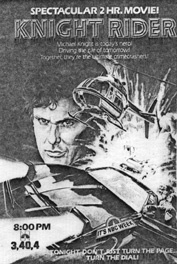 Thirty years ago tonight, Knight Rider aired for the very first time on NBC. Originally driven by NBC exec Brandon Tartikoff's desire to have a new type of action hero, it was ultimately Glen A. Laron's vision and David Hasselhoff's Michael that brought it to life. Expectations were mixed from the start, and none could predict the success at the time and culturally since that it hard. Across 82 episodes and 90 hours of television (not to mention the reunion movies, attempts at revival, and countless parodies), Knight Rider is solidified in history. We want to take a moment to thank everyone who helped bring this show to air, and inspiring a generation. The belief that one person can be empowered to make a difference against great odds as been instilled in the core of many - and for that we thank you! So tonight, grab your DVD, VHS, Hulu or whatever method you have at your disposal - and rewatch the Pilot episode and try to remember what it felt like way back when. We have plenty of discussions in our forum highlighting some of the articles from back in the day, and be sure to check out our episode page for more on the episode itself - including the teaser for the original premier! David Hasselhoff is interviewed, talks about his replica and gives a shout out to KnightCon, Knight Rider Festival and replica owners! Deanna Russo has landed a new role on the Syfy series Being Human and is currently filming episodes that will air in 2013 - Congrats Deanna! Southern Knights Atlanta was held last weekend and was a great success, check out their facebook page or our forum for some pictures and videos from the event. Ed Crick, Ron Martinez, Rebecca Holden and Michael Scheffe were in attendance. Congrats to Mark! Be sure to check out Catherine Hickland as she preforms her awesome comedy hypnotist show at the Indiana State Fair on August 15-17. Glen Laron's lawsuit against Universal Judge survives the first hurdle as the rejected Universal's attempt to toss his key claims at the initial stage. The suit first filled in 2011 argues that Universal has unfairly compensated Larson productions on residuals from his successful shows including Knight Rider. Now available at Toys R Us - Minimates Knight Rider exclusive! Late last year, we told you about the Minimates Knight Rider line, which has since seen the release of SPM KITT and Michael as well as KARR and Garthe. There was a third model that was also to be released around the same time, but was delayed until recently. In the last few weeks, we've been able to see this item available in our local stores and on their website. For only $9.99 you get KITT in his memorable mode, with Michael Knight in his classic red shirt and jeans outfit. A really great line of products by the Diamond Select team! You can order yours now at toysrus.com or by visiting your local Toys "R" Us and asking for it by name. 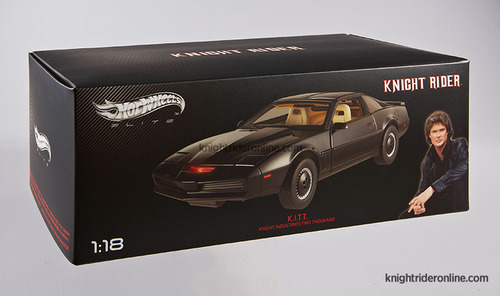 Diamond Select's 1:15 scale KITT is also still available for pre-order with the KITT only version due for release this October. Ten Exclusive Views of the Hot Wheels Elite Knight Rider KITT 1:18! The good folks at Hot Wheels have been busy, with their recent 1:64 release, and their booth at San Diego Comic Con and now this! Our friends at the Hot Wheels Elite group, whom have been giving us a sneak peak of their model process for a few months now, sent us these high quality prototype shots. For the first time we get a sneak peak at the fully rendered model, complete with Season 1 dash. He's a thing of beauty, and limited to only 10,000 pieces - so be sure to get your pre-orders in! It's on track to release later this year.